Thank you to my friend Hannah for recommending this series to me! I enjoyed this more than I thought I would. After reading Harris' Lily Bard series and Aurora Teagarden series and being disappointed that they weren't as good as her Sookie Stackhouse series, I didn't have high hopes for Grave Sight. However, I was pleasantly surprised. I can't reconcile the differences between Harris' series. How can her Sookie books be so good and the Aurora Teagarden books be so boring? I'm thinking it has to be because the Aurora books were her first series. Like Sookie, Harper Connelly, our heroine in Grave Sight, has a special skill. She can sense dead people and how they've died. I'm guessing that each book in the Harper series will take us to a different location, as Harper travels across the country either finding bodies or discovering the method of death for a fee of $5,000 a pop. I like that this book was a short mystery which was resolved at the end. I really like how Charlaine Harris ends her series novels. They leave you wanting more but aren't total cliffhangers like so many other authors (think PC Cast's House of Night series and Suzanne Collins' Hunger Games series). 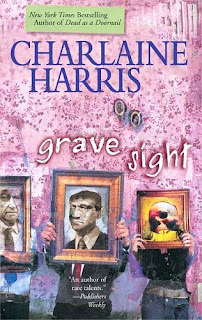 While a little predictable, Grave Sight was entertaining, and in true Harris style, the ending and resolution of the mystery gives the reader a little surprise. I'll definitely be reading more of this series. I got tired of reading how the characters were dressed. This comes from a self-proclaimed clothes horse, so you know there's a lot of talk about clothes! One of the characters is named Mariella. I love that name! Probably not, as there are multiple descriptions of murders. The descriptions are not grisly, just matter of fact. That's what kept it from being scary, since I usually don't read books about ghosts and the like.